The diversity of language in the Northern Territory came under intense scrutiny in the Central Australian Linguistics Circle in Alice Springs on April 19. Linguists and language speakers from Central Australia presented their work in progress in an informal session. Nine speakers explored topics that included new mixed languages in the NT, Indigenous languages and culture in Central Australian schools and the history and development of Australian phonology between the 1930s and 60s. Myfany Turpin, Research Associate at School for Social Policy and Research at CDU presented research on cultural signs. She said the event offered engaging insights into the diversity of language and linguistics throughout the Territory. 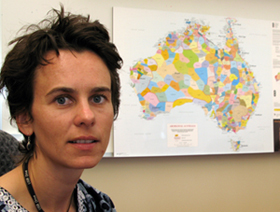 ‘It gave people working on Central Australian languages and literacy the opportunity to discuss their work and there was plenty of positive feedback,’ she said.